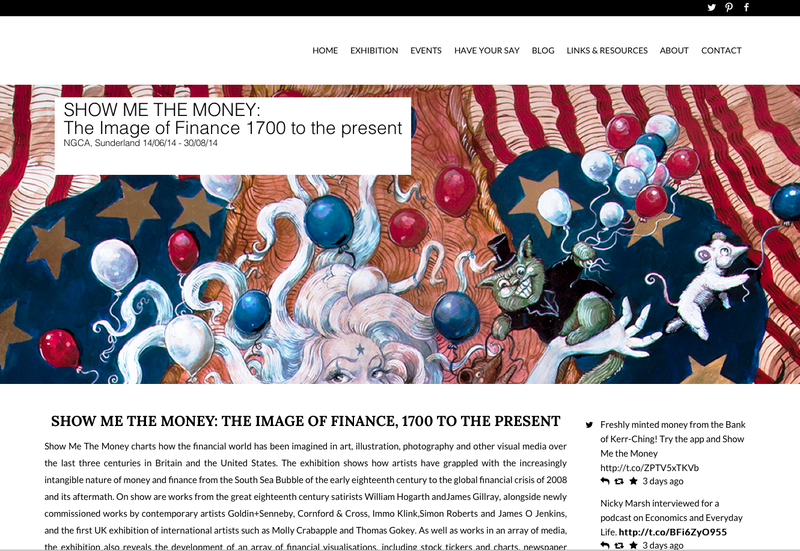 Show Me The Money charts how the financial world has been imagined in art, illustration, photography and other visual media over the last three centuries in Britain and the United States. The exhibition shows how artists have grappled with the increasingly intangible nature of money and finance from the South Sea Bubble of the early eighteenth century to the global financial crisis of 2008 and its aftermath. On show are works from the great eighteenth century satirists William Hogarth and James Gillray, alongside newly commissioned works by contemporary artists Goldin+Senneby, Cornford & Cross, Immo Klink,Simon Roberts and James O Jenkins, and the first UK exhibition of international artists such as Molly Crabapple and Thomas Gokey. As well as works in an array of media, the exhibition also reveals the development of an array of financial visualisations, including stock tickers and charts, newspaper illustrations, bank adverts and electronic trading systems.